Last year Dave Whiteland wrote about our first experience of using design thinking in creating the specification for a Freedom of Information Project in South Africa. For those of you unfamiliar with the design thinking approach, it is worth me providing a little context (borrowing heavily from Dave’s text). Traditionally mySociety has built international digital projects by working closely with our local partner to define a specification. We then build to this specification and seek to continually improve it . We perform usability tests, we apply A/B testing, and we think hard about what our analytics tell us. The problem is that much of this is reactive, iterative design: it’s being applied after the core product has already been built. 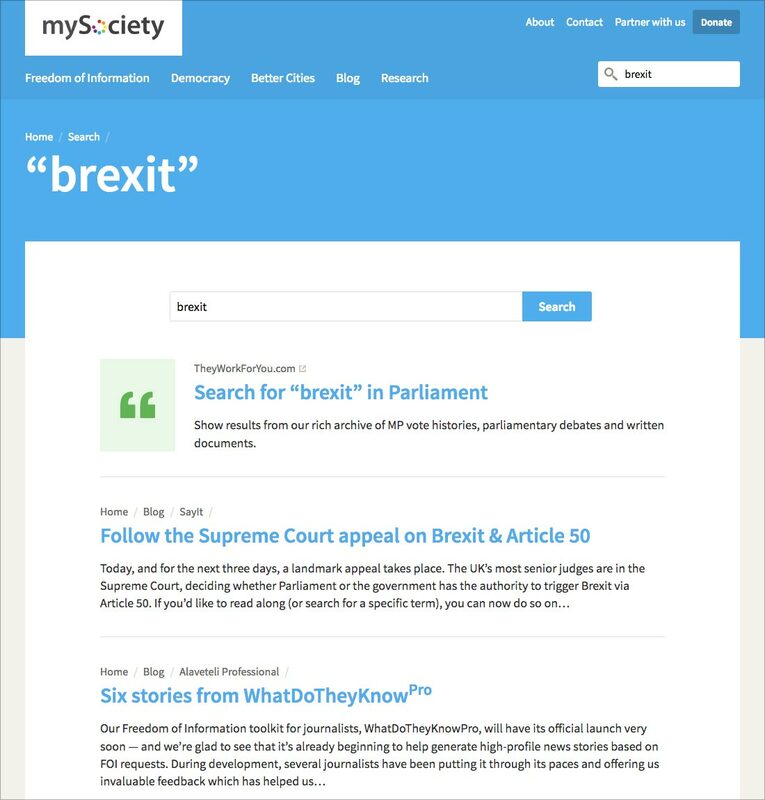 mySociety is dedicated to maximizing the impact of its projects by tailoring solutions to the local context. As part of this, we have committed to only carrying out new large-scale international digital projects where we can follow these design principles. One challenge with this approach is that, unlike traditional projects, we are unable to provide funders with a clear description of what the project will deliver. At the start of the process the tools that will be built and the processes and infrastructure that will surround them are unclear. Furthermore, all this prototyping and piloting adds to the time these projects take to complete. In Making All Voices Count we were incredibly fortunate to find a funder who was not only undeterred by these concerns but actively appreciated the value of the approach. 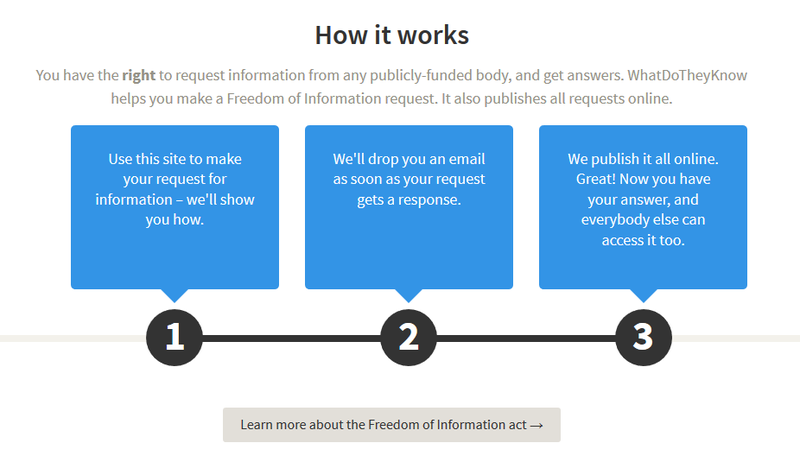 Earlier this year they awarded us a scaling grant to work for a two-year period on a Freedom of Information project in Liberia. 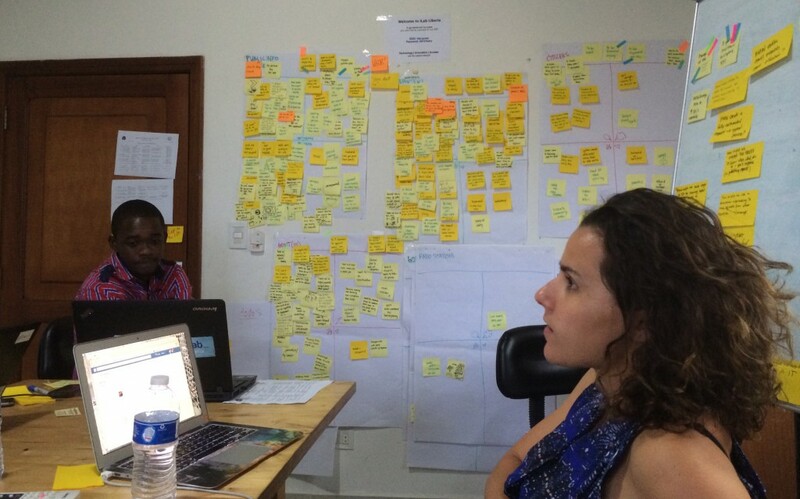 Last week the project team met up in Monrovia to start the design process. Our partners on the project are the iLab Liberia and Public Works at Stanford, an offshoot of the d.school which focuses on applying design thinking to governance in the developing world. The staff working on the project are Luther Jeke, Carter Draper and Teemu Ropponen (Ilab); Jenny Stefanotti (Stanford); and Paul Lenz, Dave Whiteland and Jen Bramley (mySociety). So what does this actually entail? Briefly, it first involves meeting with a large range of different stakeholders, users and potential users and building up an understanding of their current behaviours, their needs, challenges and perspectives. We interviewed more than 20 people, including the Information Minister, the Independent Information Commissioner, investigative journalists, Public Information Officers, FOI NGOs and community groups. Each day we would break down our notes from these interviews into things said, thought, done or felt, and group them by type of stakeholder. This is a very active and visual process, resulting in sheets of paper being covered in hundreds of Post-It notes. In working through this process it became clear to us that there were a number of common issues. 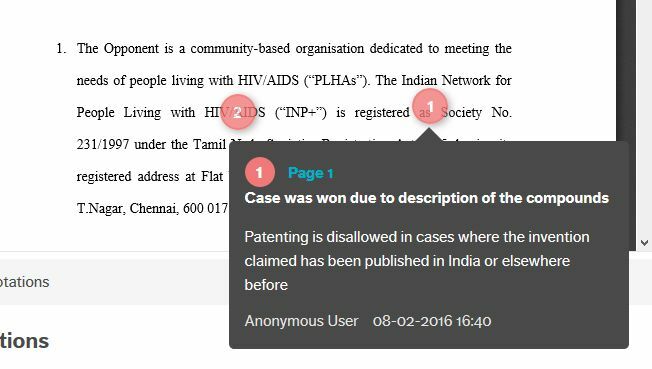 Firstly, while the FOI law in Liberia is legally very strong, in practice adherence is pretty poor – partially due to simple process failures, and perhaps sometimes due to willful avoidance. Secondly, despite significant resources being invested in “sensitising” (educating) citizens about the law, very few FOI requests have ever been made by individual “average” citizens; rather they have been submitted by NGOs, journalists and activist groups. These two finding might not be hugely surprising, but others were perhaps less obvious. 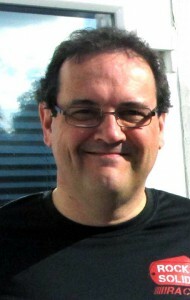 For example, almost without exception, the Public Information Officers that we met were deeply proud of their work and wished the FOI law was used more; even though the law allows for electronic or phone call requests to be made in reality each request must be hand-delivered, hard copy, and a receipt obtained; finally, even skilled and experienced investigative journalists can end up spending years chasing requests through a Kafkaesque bureaucracy that takes advantage of the requester’s ignorance of the detail of the law. The next stage, that we are really only just starting, is to identify some approaches that might address these issues, and then to find a way to attempt to prototype the solutions. 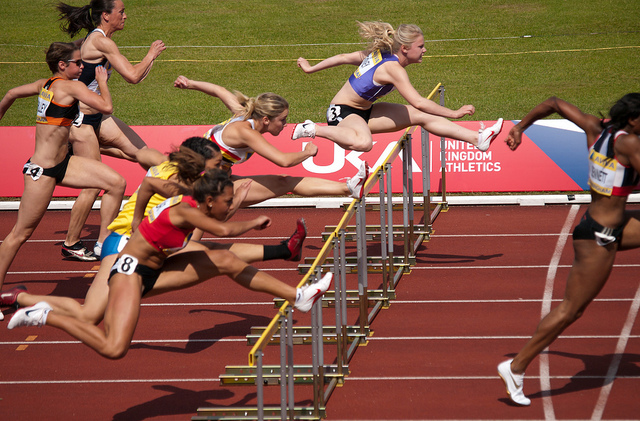 To save time and cost and in order to enable maximum flexibility these prototypes often take a “Wizard of Oz” approach – human intervention in lieu of building a technical platform to trial. An example would be rather than building an SMS gateway that interfaces with a computer system the prototype relies upon a person simply receiving the SMS on their phone and typing it into a form. The week was incredibly intense and rewarding driven by Jenny’s fantastic energy in overseeing the whole process, and the great commitment and engagement from the iLab team – particularly given the developing situation with Ebola while we were there. 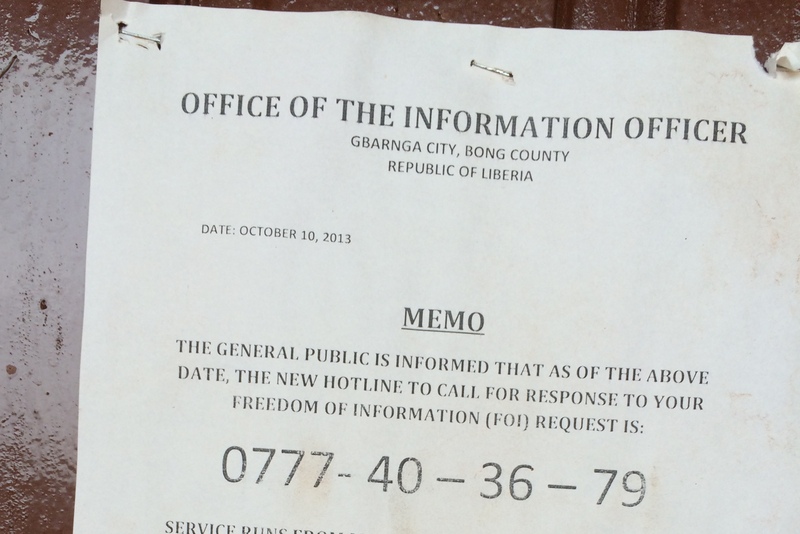 You might ask: given the infrastructure, income and health challenges facing Liberia , does FOI really matter? Is it perhaps a right to be addressed when more essential needs have been met? Are people even worried about being able to request information from their representatives, due to the other factors at play? 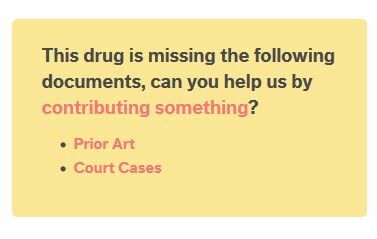 We hope that’s a question that is hard to answer, since FixMyStreet was built for everyone – or rather, anyone who wants to report a street problem to their council. 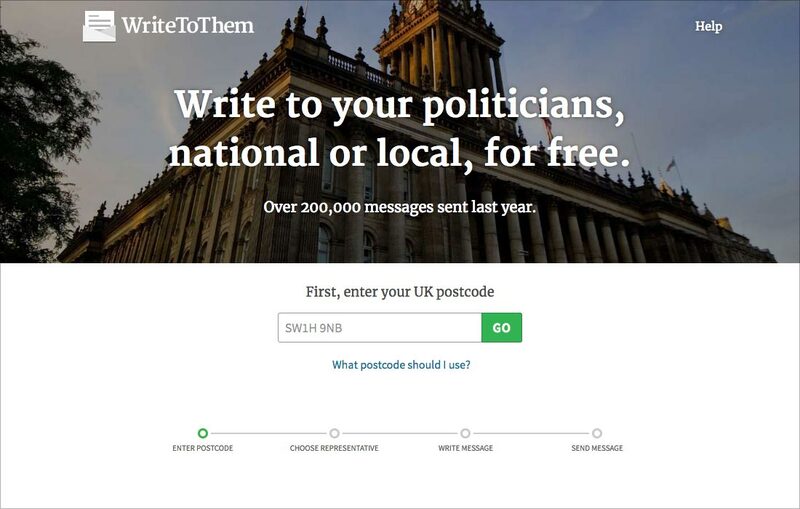 Computer whizz or internet newbie, one-off reporter or serial council communicator, FixMyStreet is for you. I’m not sure how I heard about it – it’s lost in the mists of time, but it was pretty soon after it went public. I see from your archives that I first reported a problem in July 2007, but I’m sure I knew about it before then. As a board member for Schoolforge I was always searching for UK open source projects for education, and that’s probably where I came across it initially. 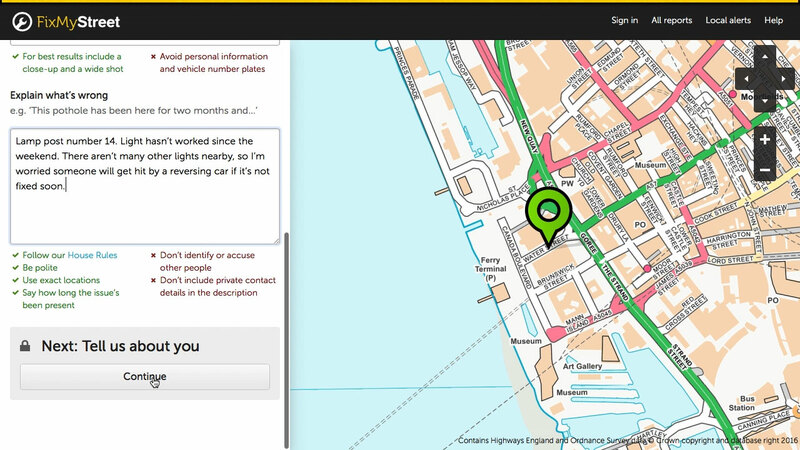 FixMyStreet can be used to report any street problems to the council – it’s most commonly used for potholes, broken streetlights, fly tipping, etc. But every user has their own concerns. What does Steve tend to report? It’s usually road-related, as I used to push /walk the kids to school when they were young, and I cycle around a lot. So potholes, traffic lights not responding to bikes, broken street lights, bad signage, low hanging vegetation… I think I reported a crop of Japanese knotweed once. You did! Here it is. And have the issues been fixed? Many have, according to your archive. 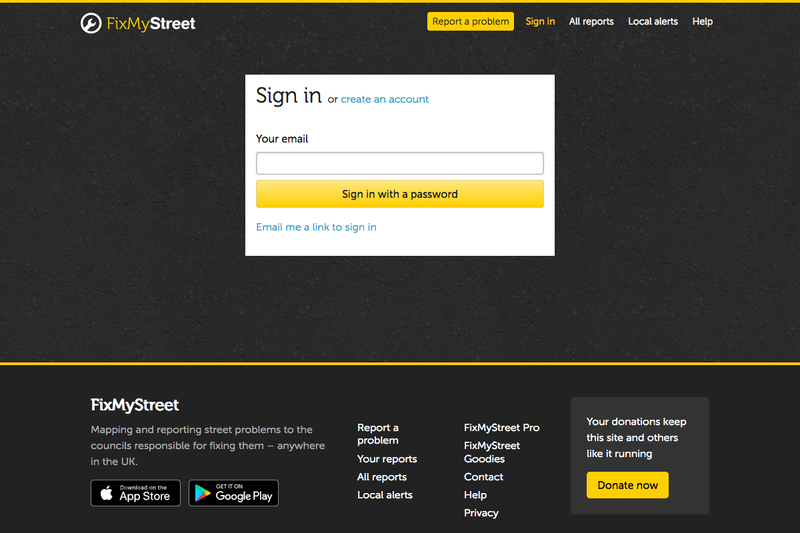 I reckon that using FixMyStreet helped raise the priority, but you never know – and that’s fine. I like to think that reports come to attention of the relevant people more quickly when you put them online where everyone can see them. 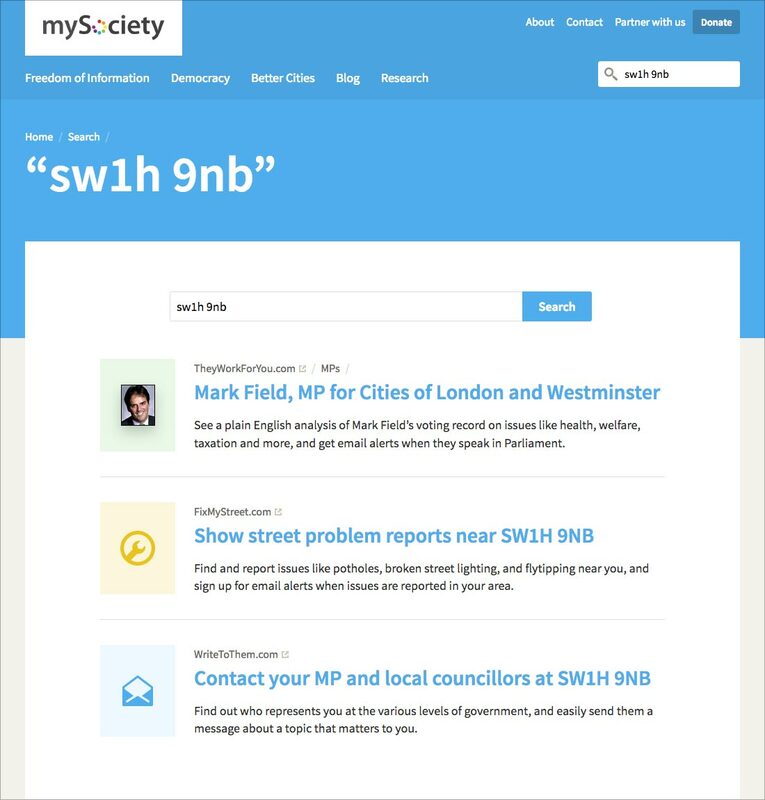 Also, when you see an issue in the neighbourhood, it’s easy to assume that someone else has reported it, but as it’s so easy to ping off a report with FixMyStreet, there’s no excuse not to play your part as a citizen. 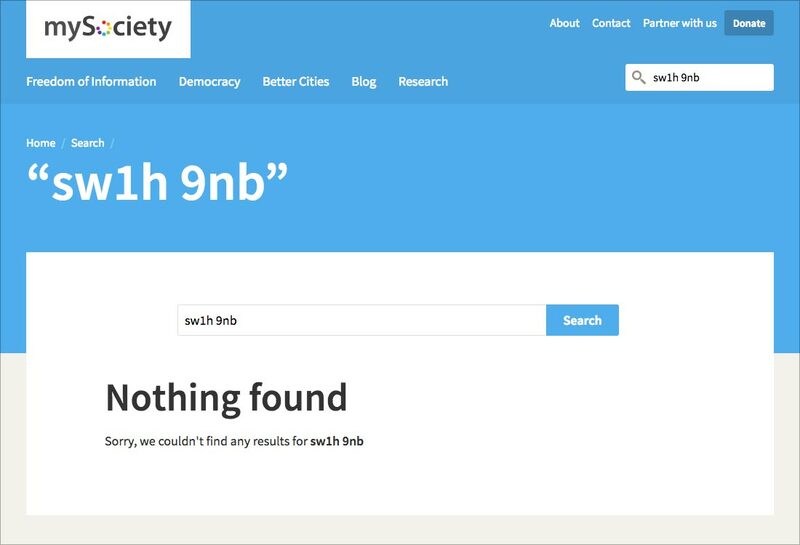 I appreciate that there’s no need to find the relevant council department, website, or whatever. 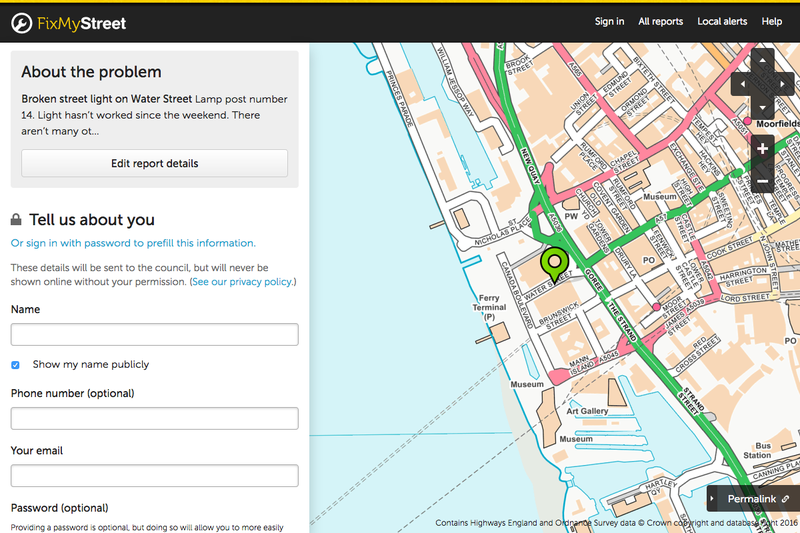 Just point your browser at FixMyStreet, type in a location, click on the map and type in the problem. Sorted. Plus if others have used it to report the same issue, you’ll see straight away. 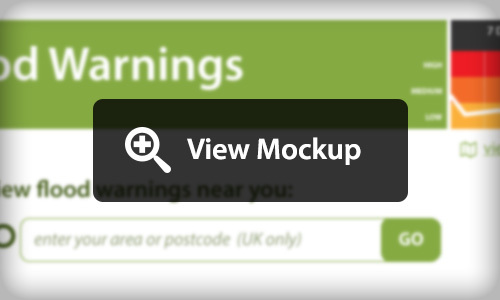 Steve’s noticed an improvement in the way that councils interact with FixMyStreet reports. I can’t vouch for how fast they get fixed, but at least I usually get an email response from the council to acknowledge receipt. These have improved over the years too, indicating that the council have sorted their processes to better incorporate FixMyStreet reports. 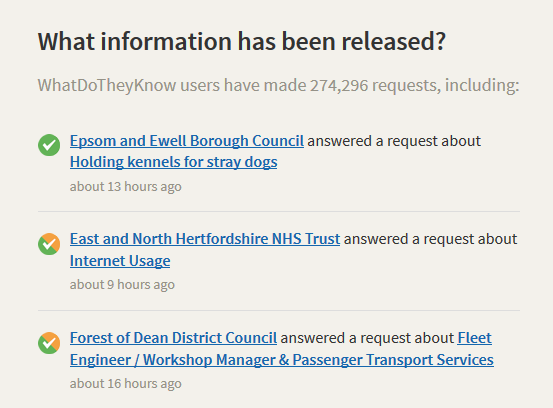 Does Steve ever browse FixMyStreet to see what has been reported in his local area? Or subscribe to email alerts? Very rarely, but it is interesting to see what’s been going on. When you report a problem, the process shows you issues that have already been reported in the same area, so you don’t need to browse first as a separate step. It’s well thought out and easy to use. I especially appreciate that I don’t have to create an account as a first step to reporting a problem: more sites should use a lazy login like this. 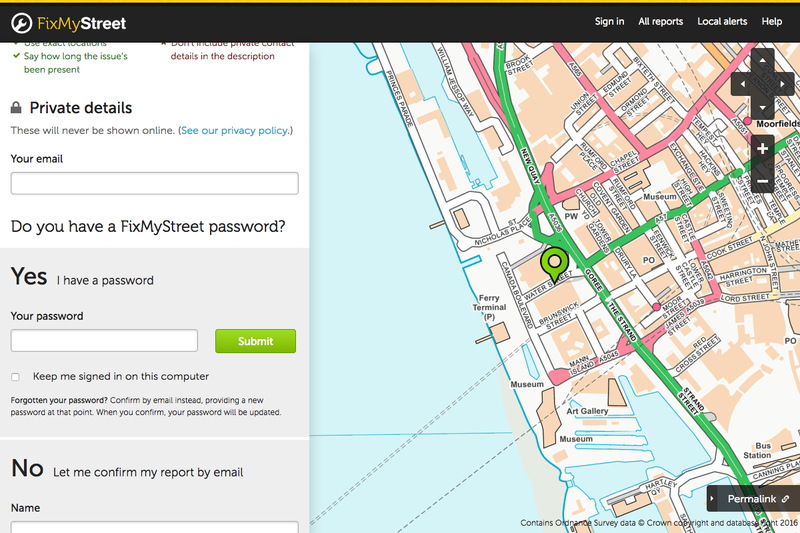 FixMyStreet has slowly improved over the years; the most noticeable thing is the improved maps. Also, it’s open source and that is important for such civic software. I don’t know if you get much open development with others contributing, but I do suspect that others use the code. Yep, they sure do. 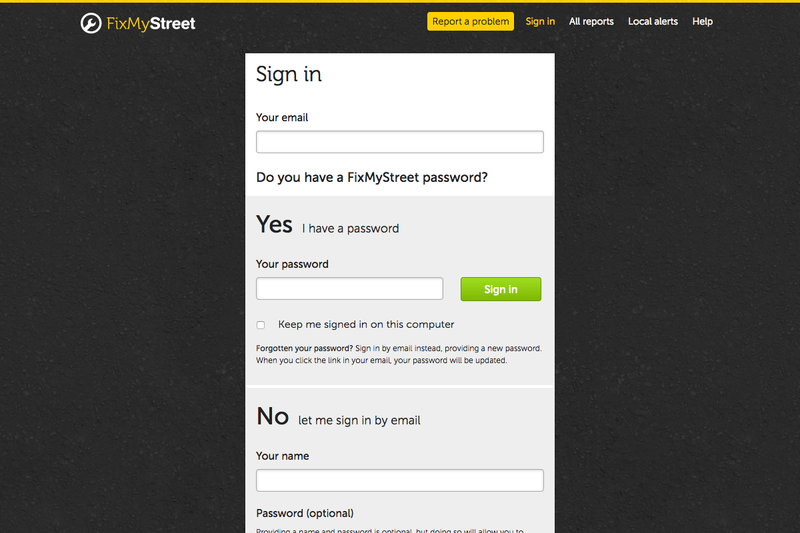 FixMyStreet Platform is the place to look for that activity, where there’s also a link to our mailing list. The most significant contributions come from people in other countries who are setting up their own version – FixMyStreet in Norway, for example. Thanks very much to Steve for telling us about how he uses FixMyStreet. This post is part of a mini-series, in which we’ll be chatting to people who regularly use mySociety’s websites. See also: WhatDoTheyKnow user, Jonathan and WriteToThem user, Kate. If you are a regular user of any of our sites, do drop us a line – we’d love to profile you too. If you live anywhere in Britain, it won’t have escaped your attention that it’s been raining a bit, recently. This has been causing quite a bit of flooding. And when flooding happens, people need to know if it is going to affect them. It doesn’t answer the main question: Most users arriving at this page simply want to know if they might be in danger. The page should be all about answering that question. It is trying to serve national and local needs: Information about flooding across the whole country might be useful to journalists or civil servants, but it shouldn’t be the main element. Clutter, clutter: A massive grid of numbers which don’t really mean anything, plus lots of sidebar links. Confusing graphics: The page contains a national map which doesn’t actually make it clear that the colours relate to the seriousness of flooding, or that it provides links to further content. There are also some non-design problems with the postcode lookup, but today we want to stick to just the design issues. At mySociety we try to be constructive in our criticism, and so whilst the flood waters are still draining from many people’s homes, we thought that we could do something positive. 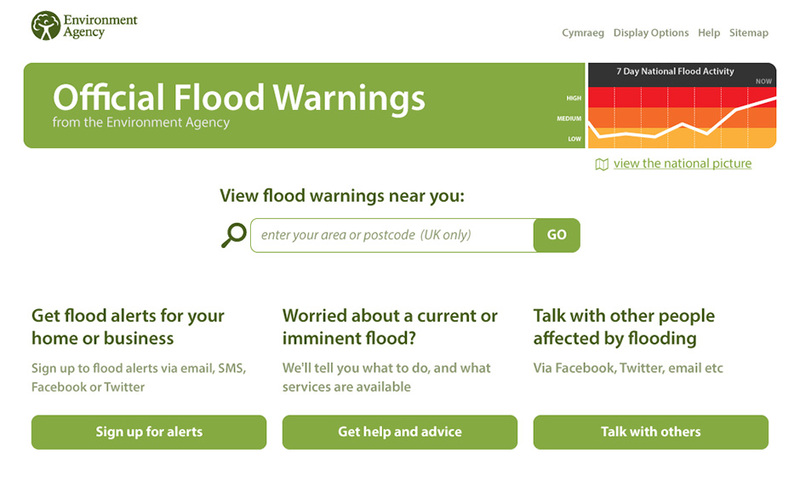 We want to show that a flood warning page could be an exemplar of clear, user-centered information design. So we made a mockup. A big page title that makes it obvious what this page is, and the fact that it is official information. All the main elements on the page are now focussed on the most likely needs of potential flood victims – journalists can follow a link to a different page for their needs. We’ve removed roughly 90% of the links on the page for clarity. We’ve removed all numerical data because it wasn’t adding value. Nobody can know if ‘5 warnings’ is a lot or a little without some context. As a nod to the overall context we’ve put in a simple graph, similar to a sparkline. It presents a clear button to click on if you’re actually endangered by a flood. It gives you a way to find out if other people near you are talking about local flooding via social media. We hope you like this. It’s just the product of a couple of hours’ work, so if you have any suggestions on how it could be better, please let us know. And, of course, we’re always happy to do similar work for other people.